This book follows the lives of Melody Carver and Frankie Stein. Two very different individuals who have less than nothing in common. Melody and Frankie at the end find themselves joining together to help save everything that they love. Along the way, the girls find romance, although it comes in many unexpected forms. This book was an okay read. It was an interesting storyline. I would recommend this book to people who like reading about monsters. I would also recommend this book for those who may not like all the gore and horror aspects of traditional monster stories. The book does have switching perspectives, which could appeal to some readers. This book follows the lives of Melody Carver, Frankie Stein and Cleo De Nile. While they try to save their friends and their family, they must find a way to stop a video that exposes their secret monster identities. If they can't, the whole monster community will be in shambles. This book was okay to read, the chapters are fairly short, which may make it a little confusing to read, considering that the chapters switch perspectives each time. The book did have a nice level of suspense, and made the ending an interesting one. I would recommend this book to someone who likes reading about monsters, but without all the gore and horror. The book can be a bit confusing at times, especially to those who don't like switching perspectives. 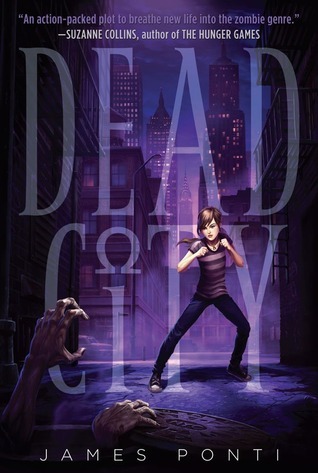 This book by James Ponti is about a young girl who has a connection to the under belly of New York City. Molly’s mother is an expert on zombies - not as a hobby but as her night job. I really enjoyed this book because of the suspenseful scenes that make you keep reading. But I also liked how the story was written and how the writer told the inside thoughts of the characters such as how Molly felt after she found out that her mom never told her about her night job. I think most kids would like reading this book, boys and girls alike. I can’t wait to read the next book in the series! A plague has turned people into zombies. Nobody knows how or why it started, but now everywhere you turn you see gray skin. R, a zombie who can't remember his own name, is the one who must change the zombies' fate. I liked this book a lot because R, the main character, is trying his hardest to regain his ability to care. With Julie, R can care again and tries his hardest to keep his humanity out for others to see. This book has romance AND zombies for anyone who needs a little thrill. There is also some supernatural bits with R as he gets closer to saving human kind. World War Z is the written oral history of the zombie war. It is a series of interviews of survivors and people who fought on the front lines. I like the book because the writer's diction gives it a feeling of reality and you can almost see the person being interviewed talking to you directly. I would recommend this book to people who love zombie stories and suspense. The Dead is a prequel to the book, The Enemy, taking place a year before the action in the previous book. Around the world, everyone over 18 has turned into flesh eating monsters. In London a group of teenagers from a boarding school try to escape to the city to find food and somewhere to live. I like this book because it is fast-paced, full of action and adventure and has multiple plot twists. Plus,there is a character who has the same name as me which doesn't happen often with me. I would recommend this book to people who like Zombie action and sarcastic, witty humor. The Enemy, by Charlie Higson, is about a group of kids surviving in a world where all adults have turned into zombies. After one kid by the name of Small Sam is taken by the adults, the rest decide to find a new place to live where there is more food and better defended. When Small Sam escapes, he tries to find his way back home to find it empty. The Enemy is a great book that keeps you up wanting to see what happens next! I would recommend this book to anyone who loves witty humor and zombie carnage. Anything can happen in today's world, even a nuclear attack. In Ashes, Alex, a young teen who has a monster inside of her, a brain tumor, decides to go hiking in the woods so that she can finally say good-bye to her deceased parents. In the middle of her camping trip, she meets Ellie, a little stubborn eight-year old brat, and her Grandfather. Suddenly, something happens. Grandpa falls over in pain and before Alex could do anything, she finds herself enveloped in pain as well. When she finally awakens, she finds Grandpa dead and for once she can smell. Alex takes Ellie and tries to make her way to the ranger station because right now she knows that they need help. Along the way, Alex and Ellie come across kids like them only there's one difference: they've become savage cannibals. Alex and Ellie are rescued on their way to the station by Tom, a soldier, and the trio join together to find out what has happened to their world and if there is any safe place, any order within this chaos. Ashes is an amazing book that leaves you wondering and questioning. You are constantly in the dark and piece things together just as Alex begins to understand them. The story is compelling and will hold your attention from beginning to end. Like few other similar books, Ashes explores the dark side of human nature and shows how in chaotic situations we too can become savages, we too are forced to do things we would never have dreamed of doing. I would recommend this book to all others who enjoy a compelling story and don't mind being left in the dark and not one step ahead of the characters. If you liked books such as The Maze Runner and Lord of the Flies, books about survival, books with what-ifs and how-comes, then Ashes is the book for you. Nick Gautier, age 14, is the smartest kid in school, even if he only has his mother and is living on scholarship. Nick soon finds himself learning that things that go bump in the night... are actually real! He befriends Kyrian, a man who gives him a job and apparently fights demons. He has new enemies and they make his old ones look like wimps compared to them. He needs to save the world and he needs help doing so. Nothing can go wrong, right? Infinity is a great story of how a boy can go from a normal outcast to the most wanted person in the universe. This is the most gripping book I have ever read, and I never put it down! I recommend this book to anyone who loves scary fiction and can relate to being a social outcast.